When is clearcutting the right choice? A clearcut is an area of forestland where most of the standing trees are logged at the same time and a few trees remain post-harvest. Forested buffers are left around streams and lakes, and the area is replanted within two years of harvest. The practice of clearcutting has changed dramatically in recent years in response to public concerns, scientific findings and advanced harvest practices. 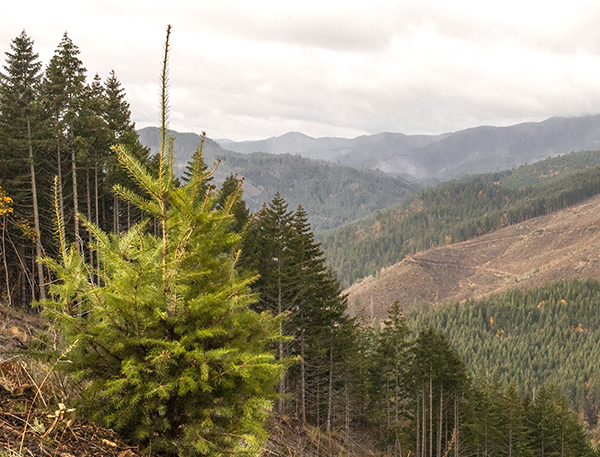 In western Oregon, clearcutting can be the most appropriate harvest method for certain tree species. For example, clearcutting is often used in Douglas-fir forests because new seedlings need direct sunlight to grow quickly. In eastern Oregon, most common tree species are more shade tolerant, so landowners are freer to use selective harvest methods such as thinning to allow trees to naturally regenerate. There are some similarities between a clearcut harvest and a forest opening caused by natural disturbances such as wildfires, windstorms, flooding and volcanic eruptions. Just like these natural occurrences, clearcuts create open space that many plants and animals need to flourish. Because a clearcut receives more sunlight, it creates optimal growing conditions for sun-loving shrubs, herbs and grasses that provide forage for animals such as deer and elk, as well as habitat for pollinators such as moths, butterflies and bees. They look bad. Until the newly planted trees “green up” a hillside, a clearcut is not considered appealing to the general public. Habitat disturbance. Clearcutting alters the habitat where trees once stood, and forest wildlife is displaced into new areas. Increased stream flow. Clearcuts allow more water to enter a stream system through underground aquifers, because water is not being taken up and released by trees in a process called “evapotranspiration.” Increased stream flows can lead to increased riparian erosion during high-water occurrences. It creates wide, open spaces with lots of sun exposure. This allows the most sunlight to reach tree seedlings that require full-sun conditions to thrive. Clearcutting also creates forest clearings that are habitat for some species of songbirds, deer and elk. Economy of harvest. Clearcutting is the most efficient and economical method of harvesting a large group of trees. Fewer disturbances to the forest floor. By entering a forest to log trees once instead of multiple times in a series of timber harvests, the landowner minimizes disturbance to forest soil. Douglas-fir trees like sun. If you've seen a clearcut recently, odds are it's been on the west side of the Cascade Range. West of the Cascades, where eight out of 10 trees are Oregon's native Douglas-fir, forest landowners choose to clearcut because the Douglas-fir seedlings planted after harvest grow best in full sunlight. In the drier, sunnier Ponderosa pine forests east of the Cascades, the forest canopy helps protect fragile seedlings from heat and frost, so clearcutting is less common. Trees are usually harvested individually or in small groups. Thinning in western Oregon forests is typically done in overcrowded stands of trees. Removing selected trees reduces the competition for sunlight, water and nutrients, helping the remaining trees stay healthy and grow faster. But when it comes to harvesting mature trees for timber west of the Cascades, clearcutting is more common than thinning. That’s because the predominant tree species in western Oregon forests is Douglas-fir, and its seedlings need full sun to thrive. They will not grow well in the understory unless the overstory trees are very widely spaced. By creating a clearing with lots of sun exposure, clearcutting provides more ideal growing conditions for Douglas-fir seedlings planted after the timber is harvested. Another disadvantage of using thinning to harvest timber in western Oregon is that if you create too much space between taller trees that grew up in a dense west-side forest, it increases wind exposure and the chances that they’ll be blown over. Following harvest, Oregon law requires that trees be left as buffers along streams to protect water and fish habitat. And in the clearcut area, two trees or snags and two down logs per acre must be retained for wildlife habitat. After harvest, seedlings must be planted within two planting seasons, which typically run January through April. Oregon rules limit clearcuts to 120 acres, and adjacent areas in the same ownership cannot be clear cut until new trees on the original harvest site are well-established. This “green-up rule” requires that planted seedlings must be four feet tall or four years-old and “free to grow” before harvest can occur on an adjacent stand, meaning Oregon has an additional standard beyond survival for establishing a new forest. Clearcutting is used when replanting a species like Douglas-fir. Douglas-fir seedlings need full-sun conditions in order to thrive.